Metro is the local transit system in most part of Los Angeles County. 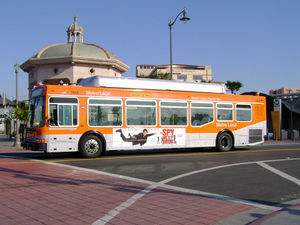 Metro operates buses primarily in the City of Los Angeles and rail service throughout LA county. Metro's services connect with other transit operators throughout the region. Metro provides rail and local mainline bus service in those cities/communities. Other agencies like Long Beach Transit, AVTA and Foothill Transit provide mainline bus service in other parts of the LA County. Most cities in the county also run intra-city shuttle/circulator routes.